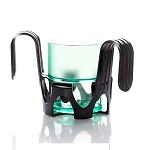 An adapted glass and cup holder ideal for increasing dining freedom. Flexible spout lid that also has a compartment for storing pills. Adapted drinking cup makes it easy to see the liquid level. The flexible Non-Slip Support for Cups helps to hold small glasses and yogurt cups. Adapted plate for caregivers trying to increase mealtime independence. Set of 3 easy to hold utensils for increased mealtime independence. Durable 3 compartment non-slip plate to boost dining independence. Cup for those who have difficulty or pain drinking. Non-slip plate with slope to increase dining independence. 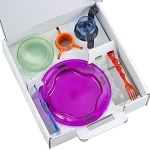 9 piece ergonomic tableware set designed to promote independent eating, made for individuals of all ages.